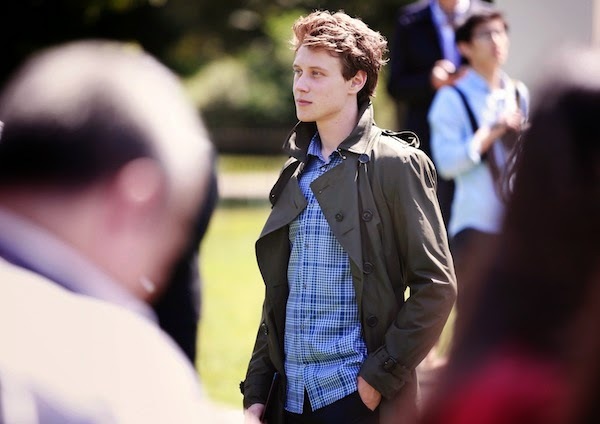 George MacKay attended the Burberry Prorsum Menswear Spring Summer 2015 show as part of London Collections: Men SS2015 on 17 June 2014 in London. The British actor wore a military olive technical trench coat, dark slate blue slim fit check cotton shirt, dark coloured trousers and brown crepe sole suede shoes, all from Burberry. George MacKay is certainly one to watch. The young artiste was awarded the BAFTA Rising Star Award and British Independent Film Award for Most Promising Newcomer. He is also on the cover of the latest British GQ Style magazine, alongside Theo James and Douglas Booth. I spoke to George MacKay prior to the Burberry Prorsum show, and took the above picture. The camera on the iPhone isn't too shabby right? Well, if you read my somewhat confusing transcript of "2 mins with George Barnett", this is going to be along the same lines. This is what I scribbled in my notebook (very in tune with the Burberry Prorsum SS15 'artist, books and sketches' collection, I am SO on trend): paired down, casual shirts, smart jeans, Tom Waits, anywhere. Would you like to make a story using those keywords? With music being an integral part of the Burberry DNA, I asked George MacKay which was the last song he downloaded. I scribbled 'Anywhere', short for 'Anywhere I Lay My Head' (thank you Google). I hope that is correct, if not: sorry Mr MacKay! And of course the first few key words relate to his usual dressing style, very much the look he went for at the show.